Escape to this upgraded 2-bedroom, 1-bathroom vacation rental cottage and experience the beautiful seacoast of Cape Cod! With accommodations for 4 guests, you'll love bringing the family here or a group of close friends. You can easily access Cape Cod Bay just 100 yards away, spending your days basking in the warm water and admiring the stunning beach views. Rinse off in the outdoor shower before exploring the local trails, shops, and restaurants to make your trip truly memorable. 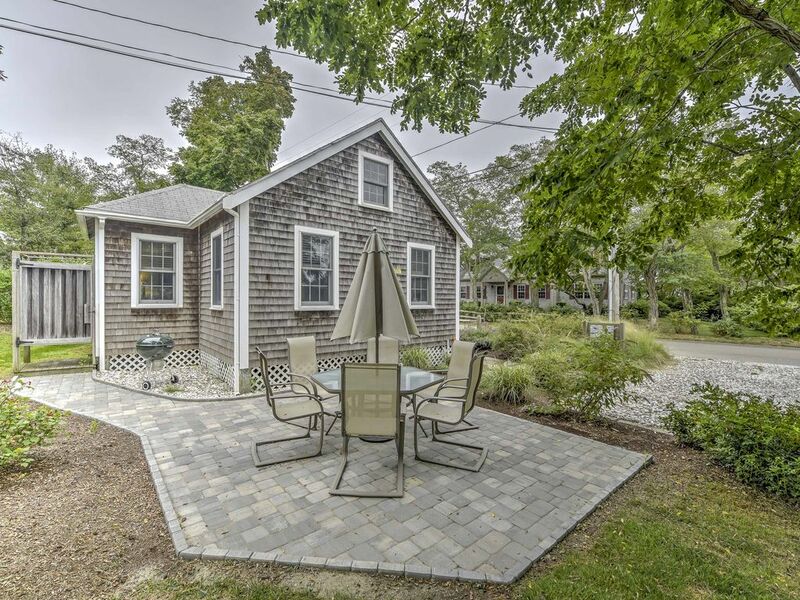 Pulling up to this quaint Cape Cod cottage you'll find instant east coast vibes with its weathered gray shingled siding and periwinkle front door. Wooden plank walls accompanied by coastal decor give the dining and living area a classic beachy feel. Enjoy all the comforts of home as you gather around the table for 4 to eat and relax on the plush couch, watching a movie on the flat-screen cable TV. Fully equipped with all of your cooking necessities, whipping up a meal for your guests will be a breeze in the recently renovated kitchen. Granite countertops with ample prepping space and white cabinetry make this light and airy room a true treat to cook in. The outdoor area features a new patio with a table and seating for 4, a great place to eat after barbecuing on the charcoal grill. Additionally, the outdoor shower attached to the back of the house makes a quick rinse convenient after spending the day on the beach! Back inside you’ll find the recently upgraded bathroom with a granite countertop sink and walk-in shower. In the master bedroom, you'll adore the antique wooden bed frame and lighthouse painting displayed against the pastel seafoam walls. Catch some shut eye while the rest of your guests cozy up on the upper level that hosts a full bed and 2 twin beds. With its unbeatable location just 100 yards from Cape Cod Bay, it will be easy to take a quick dip before breakfast, grab lunch at the cottage, and take an after-dinner stroll to watch the sunset. There are many things to do on the water all around Cape Cod, including snorkeling, kayaking, fishing, surfing, paddle boarding and sailing. Whether you're a seasoned vet or a watersport beginner, rest assured that you can find several schools around town that can teach surf and kite boarding lessons. Exploring the rest of the area, you'll find delicious seafood shacks, lighthouses, antique and art shops, and of course, ocean beaches! Just a short drive away you'll find a health club, where you can work up a sweat and keep up on your fitness! Spend a day checking out the abundance of sights and landmarks nearby that characterize Cape Cod's rich history, such as First Encounter Beach, Eastham Windmill, and Nauset Light. You can even stop by Cape Cod's only drive-in theater in Wellfleet off Route 6 for a blast from the past. A 5-mile drive will take you to National Seashore outer beach facing the Atlantic. Ride bikes down the Cape Cod Rail Trail to the National Seashore Visitor's Center to grab a postcard before gliding along the Coast Guard Beach Trail for incredible views. For a leisurely day of nature and wildlife, walk along the nearby trails on the National Seashore and Audubon Sanctuary. Located 20 miles north is Provincetown, where you'll discover many unique antique shops and experience some of the best whale watching and fishing in the area. No matter what you decide to do, you'll never have a shortage of activities to choose from! -Amenities include a fully equipped kitchen, free WiFi, flat-screen cable TV with DVD player, outdoor hot/cold shower, patio with furniture, charcoal grill, ceiling fans, and much more! -Amazing location just 100 yards away from Cape Cod Bay and minutes from the best restaurants, beaches, and landmarks! - Easy access to windsurfing, kite boarding, surfing, paddle boarding, boogie boarding and so much more! I stayed here with my 79 y.o. mother who has some mobility issues. I chose this cottage because it appeared cute and comfortable and I hoped she would be able to walk to the beach. We were very happy with this special cottage. She found the first floor bed very comfortable. We walked to the bay for a sunset and I was also able to drive her to Campground beach and drop her off, bring the car back to the cottage and walk back to the beach in minutes. We also visited Coast Guard beach on the Atlantic—it was beautiful and more easily accessible for her ( She uses a cane) vs. Nauset Light. Jerry was great— I had a few concerns when we arrived and he addressed them all. The upstairs bedroom can get warm during the day but it cooled off very quickly at night—we slept really well here. The area is very quiet at night. If we return to the cape again, I would definitely consider staying here again. The house was great for a week get away! The owner was helpful and accommodating. It was very convenient to many things. Great small cottage with just enough for my daughter and I to enjoy the Mother’s Day weekend in Eastham. Few minor questions were easily answered by Jerry by emai or phone! Didn’t know about Ragno race that weekend but was not a problem. Love love love this cottage!!!! We’ve stayed here twice now, and it’s perfect for both extended stay and weekend getaway. House is super close to Campground Beach-which is perfect for babies. The kitchen is clean and modern, and has enough gear for light cooking. The cottage is very well maintained, cozy, and super clean. Love the outdoor shower!!! Cozy & close to the beach. Lovely patio w/ Weber charcoal grill, table + 6 chairs & outdoor shower. The cottage - Newly renovated kitchen and bathroom. No air conditioning needed - the ceiling fans kept the cottage plenty cool. Perfect for couples or small families. The area - very short walk to beach. Ideal area for waking, jogging, and biking - rail trail is 7 min away on bike. Coast Guard, Nauset Lighthouse, and Marconi beaches on ocean-side each 30 min bike ride away. Camground beach is walking distance and several other bay-side beaches a short bike ride away. Get out on one of the bay-side beaches at low tide and see how far you can walk out ... especially good when there's a sunset! Recommend donuts / breakfast at The Hole in One (5 min bike ride) and fried seafood / ice cream / miniature golf at Arnold's (15 min bike ride). Only 2 minutes from the bay, how awesome is that! No need to take the car, just a quick walk. Rental was super clean and owners are very friendly. Will be returning for our 3rd season this year.